First and foremost for those who do not know what “The Reformation” means to the Lutheran Church. It is a celebration of the day Martin Luther nailed the 95 Theses to the door of the Castle Church in Wittenberg, Saxony, Germany (October 31, 1517). His 95 Theses were to protest the sale of indulgences which the Catholic Church claimed, granted forgiveness of sins. Through study of Scripture Martin had learned that we are saved by grace alone through faith alone. Forgiveness of sins, life and salvation could not be bought, but were and are free gifts from God through faith in Jesus who lived a perfect life for all people, suffered the punishment for all sin by dying on a cross, and conquered death and Satan by rising from death three days later. This year, 2015, is the 498th anniversary of the Lutheran Reformation. It falls on Halloween each year, but in reality has nothing to do with Halloween. 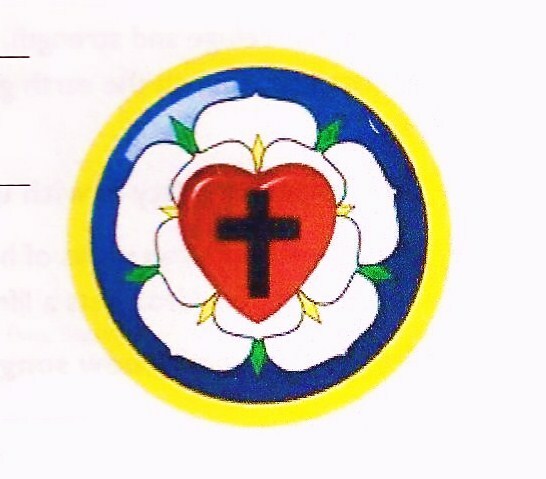 The information about Luther’s Coat of arms was taken from the service bulletin of Gloria Dei Lutheran Church in Grand Blanc, Michigan on Sunday October 27, 2013. Martin Luther designed this seal while teaching at the university of Wittenberg, Germany. I learned about Luther’s Coat of arms in school and have seen it repeatedly over the years as a representation of the Lutheran faith. But I had forgotten what it symbolized. It holds much meaning and I would like to share that information with my readers. The Black Cross – The first item expressed in the seal is a cross, black, within the red heart to remind us that faith in Christ crucified saves us. The Red Heart – Although the cross is black, shameful, and intended to cause pain, yet it does not change the color of the heart, does not destroy nature. In other words, it does not kill but keeps alive. For the just shall live by faith – by faith in Jesus. The White Rose – But this heart is fixed on the center of a white rose to show that faith in Jesus brings joy, comfort, and peace. The rose is white, not red, because white is the ideal color of all angels and blessed souls. The Blue Sky (Background) – This rose, moreover, is fixed in a sky-colored background to show that such joy of faith in the spirit is but a promise and beginning of heavenly joy to come. This joy, though not yet revealed, is looked forward to and held by the hope which we have. The Gold Circle – Around this background is a ring to show that such bliss in heaven is endless. And since the ring is made of gold, the best and most precious metal, it also shows that the bliss of heaven is more precious than all other joys and treasures. In summary, the black cross represents death (we will all face physical death). It is set in a red heart which represents the life we have through faith in our loving Savior Jesus. The white rose (the color of angels and saints) in which the heart and cross are set reminds us of the joy, comfort and peace we have through faith in Jesus. The rose sits in the background color of blue which represents the sky and the heavenly joy we look forward to through the sure hope of eternity with God. The gold ring around the circle of blue is a representation of the never ending beauty and bliss of heaven which is more precious than any earthly treasure.